Race costumes that involve JEANS! If everyone showed me the love and attention that Runner’s World does, I’d be right up there with royalty and celebrities. Seriously. The love started out with a Facebook post when the blog began. Then a mention on RW Daily. Then came the motherload: a blurb in the April print edition. Then on Friday, truly the icing on the cupcake, RW Daily gave a shout out to my two new blogs. If I didn’t know that I was the biggest dork, I would worry that my head would get big (wink wink, Mark Remy). Instead, I am nothing but honored and humbled and appreciative. I AM bothered that there is no way to give my heartfelt thanks for all the love they have showed this Pittsburgh girl. 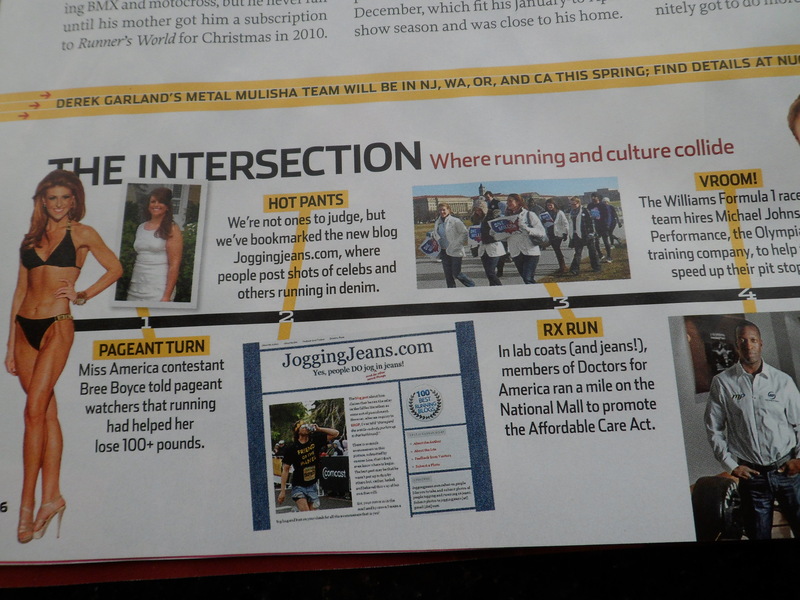 So, to the JoggingJeans.com viewers, go buy their magazine, run their races, support their advertisers, and if you happen to know of anyone in the upper-ranks of the organization, give him or her a ‘thanks’ and a hug (okay, guys can give a fistbump) from me. So…if you haven’t checked out the two links to the right (Best Race Signs and Best Race Costumes), you can do it now. 🙂 I have always been a fan of the RWDaily features that highlight the creative signs and costumes at the major races and thought that it was about time that they were all in one handy place to enjoy. If you have any pictures in your private collections that you would like to share, email them to me at JoggingJeans [@] gmail [.] com. Yeah, I do have a real job and a life. No, I don’t have time to maintain all these sites. Whatev. On to today’s post. When I was looking for costume pictures online, I stumbled upon these three pictures that involve jean-wearing runners.